Developer Bellway Homes Limited (Yorkshire) have told residents that the metal chimney on the former Dunlopillo Factory site will be removed on Friday at noon. Bolts on the bottom of the chimney are to be blown off and it shall be lowered to the ground by a crane which will be put in place. 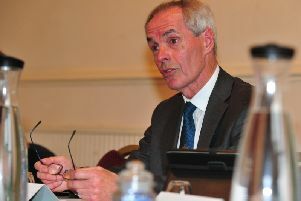 Harrogate Borough Councillor John Mann, (Con, Pannal), said that while the factory had previously provided employment for the area the knock-on effect of production and visual impact since the closure of the site had often upset residents. Coun Mannn recommended that those wanting to watch gather at 11.45am on Thirkill Drive.